Maureen Kelley, PhD, FACNM and Ashley Darcy Mahoney, PhD, NNP-BC, from Emory University's Nell Hodgson Woodruff School of Nursing, will be inducted into the American Academy of Nursing (AAN) Fellowship during a formal ceremony at the AAN’s Annual Conference and Meeting in Washington, D.C. in October. 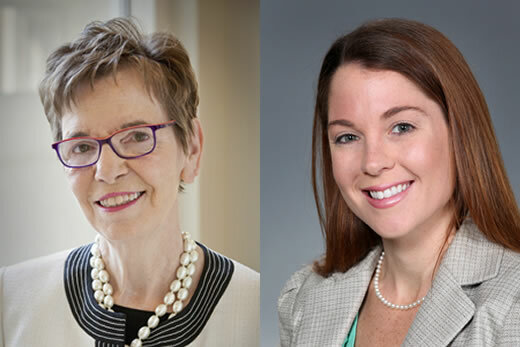 "The induction of these new fellows is highly fitting as they are both making significant inroads into the nursing, health care, and research communities," says Linda McCauley, PhD, RN dean of Emory’s Nell Hodgson Woodruff School of Nursing. Kelley is a certified nurse-midwife whose scholarly interests focus on maternal and infant health and social responsibility within the nursing profession. In the recent past, Kelley was the co-investigator for the Maternal and Newborn Health in Ethiopia Project, which was funded by an $8.1 million grant from the Bill & Melinda Gates Foundation. She was also a faculty investigator on the Pregnancy Health Among Florida Farm Workers project, where she studied the impact of environmental contaminants on female farm workers. Currently, she is principal investigator of a $3.8 million grant from the Centers for Disease Control and Prevention, which helps 20 African countries strengthen nursing regulations to ensure safe and sustainable nurse-initiated and nurse-managed HIV treatment. Darcy Mahoney is an assistant professor at the School of Nursing with research in neonatology, developmental pediatrics, and brain injury. She has dedicated her career to infant health, specifically high-risk infants' developmental outcomes. Her research seeks to improve early-childhood outcomes for these infants, most recently through language interventions. Her current work includes spearheading a collaborative effort funded by the United Way of Greater Atlanta, called Talk With Me Baby. The campaign targets parents and nurses to prevent language delays, especially among at-risk children, by coaching parents to talk more to their infants. Dr. Darcy Mahoney will develop and implement a curriculum within Emory’s School of Nursing to train nurses about the importance of social interaction with babies in and outside of the womb. The AAN is comprised of more than 2,100 nursing leaders in education, management, practice and research. The AAN serves the public and the nursing profession by advancing health policy and practice through the generation, synthesis and dissemination of nursing knowledge.